Some people may not have heard of this holiday and that is because the first day of Hanukkah and Thanksgiving haven’t fallen on the same date since 1888. I have read various estimates of when this will happen again–they range from 7,000 to 70,000 years. To be absolutely correct, as all Jewish holidays officially begin the night before, we light the first candle on Wednesday evening. In any case, none of us will see its like again so we should celebrate. All Jewish celebrations involve foods specific to the holiday, and traditionally Hanukkah highlights foods made with oil to commemorate the eight days the lamp oil lasted in the synagogue 2,000 years ago. (This is a long and complicated story about courage and the Maccabees and I won’t tell it here, but it is available elsewhere.) The foods include potato pancakes (latkes) and doughnuts, usually with jelly. So this Thanksgiving, in our house, those foods will be served alongside the turkey, sweet potatoes, stuffing, etc. While I could talk for a long time about latkes, I will confine myself to doughnuts. The search for the perfect jelly doughnut has taken up a lot of our time recently and if you think this isn’t a worthy use of our time, you haven’t tried these doughnuts. 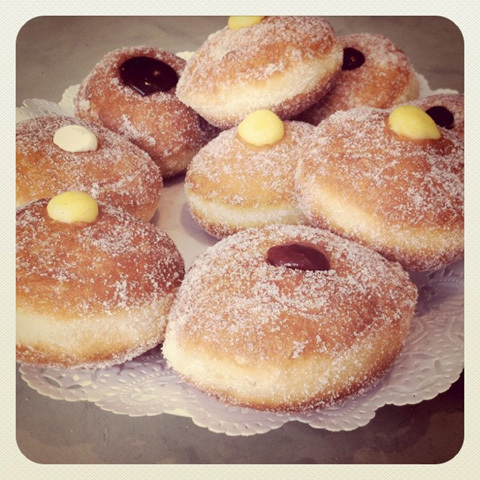 First, let’s take Bomboloni’s at 187 Columbus. 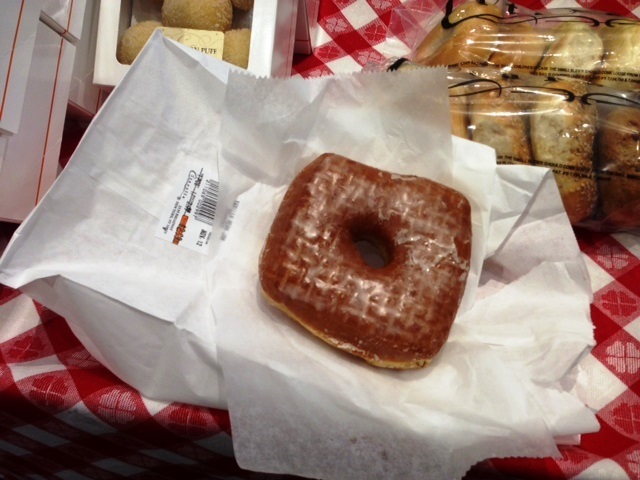 Purists may say this is not your traditional jelly doughnut but I say it’s worth considering. They don’t leave them in the oil as long and the result is a more elegant version of the classic–very very good but if you like your doughnuts really fried in oil like me–these may be too healthy for you. Zabar’s is open on Thanksgiving Day as always and swears that the doughnuts they get from Eli’s will be fresh that day. (“They’re as crazy as we are” to quote the manager.) 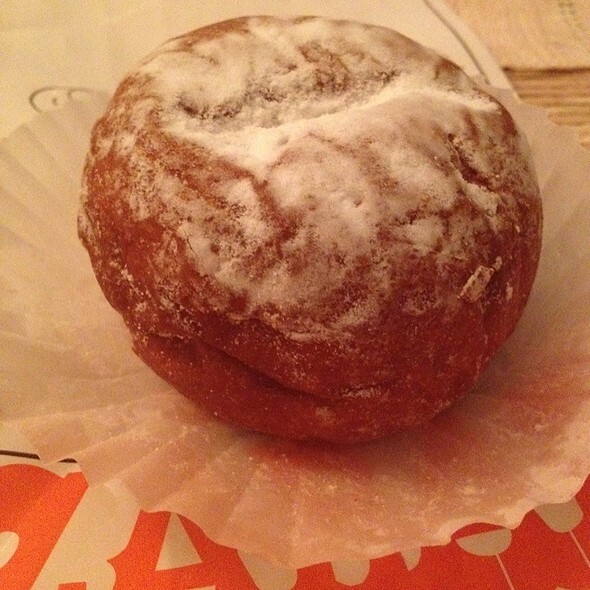 This is a good doughnut with powdered sugar on top and you can’t go too far wrong with it especially if it is fresh. 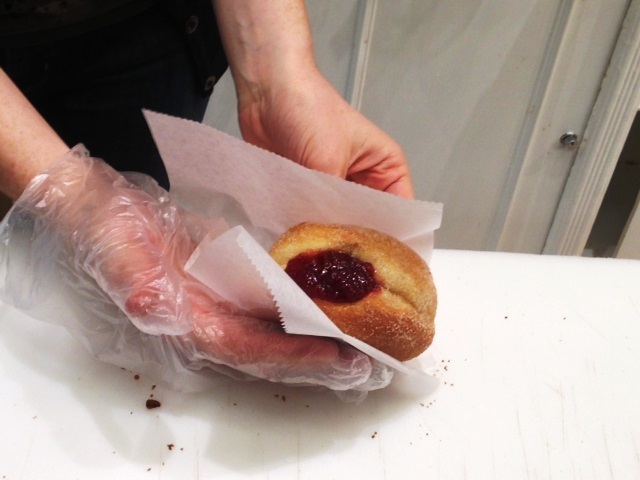 Then there is the Doughnut Plant’s jelly doughnut. You can’t miss it–it’s square, glazed on the outside, with a hole in the middle and jelly throughout–it’s sweeter than the average because of the glaze–again, very good depending on your taste. We got ours at Citarella’s but they have outlets everywhere–you need to check their website. We end with Orwasher’s at 308 East 78th Street. 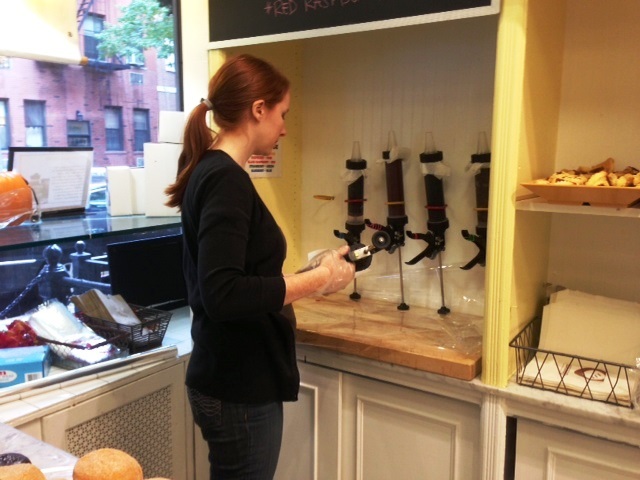 They get the doughnuts fresh from D’Aiuto, then the bakery fills them on the spot with one of Beth’s Farm Kitchen preserves. Rory likes the classic raspberry–me for the sour cherry; they are topped with granulated sugar. When you are there, try their French baguette made from imported French bread flour. Their bread is the real business of this bakery; doughnuts are a sideline, but what a sideline. Orwasher’s is not open T-Day but you can get them the day before IF YOU ORDER THEM IN ADVANCE. This goes for whichever jelly doughnut you choose.There are many other dedicated seekers out there who want to celebrate this once-in-a-lifetime holiday with you. And by the way, the secret to a really good crisp latke is this: grated potatoes (a little blood from your knuckles won’t hurt the latkes) with the extra water squeezed out, mixed with scrambled eggs and salt and fried in lots of oil–nothing else. No flour, no baking powder, nothing. Trust me on this.